Jeremy and Michelle Kyncl (left) of Hierophant Meadery with Will Jordan (right) of Twilight Ciderworks. You're going to learn something when you take a seat at the bar of the cozy Solace Mead & Cider, tucked off the main drag in Kendall Yards. You'll learn that Twilight Cider Works creates a drier, less sweet style of cider, and there's a good chance that Hierophant Meadery is going to give you your first taste of mead. The two businesses were both members of the niche alcohol industry, and also both produced their goods in the tight-knit agriculture community of Green Bluff, north of Spokane, so it seemed like a fit from the get-go. 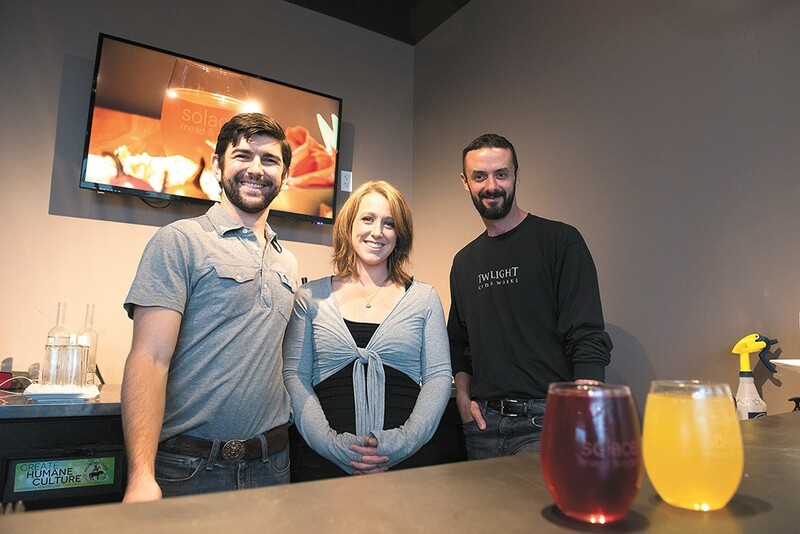 "We're an artisan cidery and a meadery, and in Spokane those are small-demographic products, so it just fits well together," says Will Jordan, who owns and operates Twilight with his wife Jackie, of his decision to create a shared tasting room with Michelle and Jeremy Kyncl of Hierophant. Education is a big part of what happens at the refined wood table bar top at Solace. There's a learning curve regarding Twilight's style of cider, which involves a longer brewing process and uses some different ingredients when compared to the sweeter mass-produced ciders flooding the market. As for Hierophant's mead, well, that's a lesson unto itself. "People have asked me, 'So you guys have a meatery?' And I have to say, 'No, not meat. It's mead," says Michelle Kyncl. Inside Solace, you'll find a half-dozen of Hierophant's meads, which range in flavor from an herbal-scented lemon mead to creations that feature some hops. On the cider side, the Jordans have ventured into draft ciders, and have four of those on tap. But you can also get pours from the 750 ml bottles — or buy one to take home — that until Solace opened were only available at Twilight's Green Bluff production side. For food, Solace offers a menu of small plate offerings. An additional teaching moment at Solace comes when they have to explain their business model. The idea of multiple beverage producers sharing resources is still fairly rare, the precedent being set locally with Steel Barrel, which features beer from both Little Spokane and Young Buck breweries. And in Southern California, a cidery and meadery joined forces right before Solace opened. Sat., April 27, 5-8 p.m.